Dit is aflevering 86 van de Erno Hannink Show. 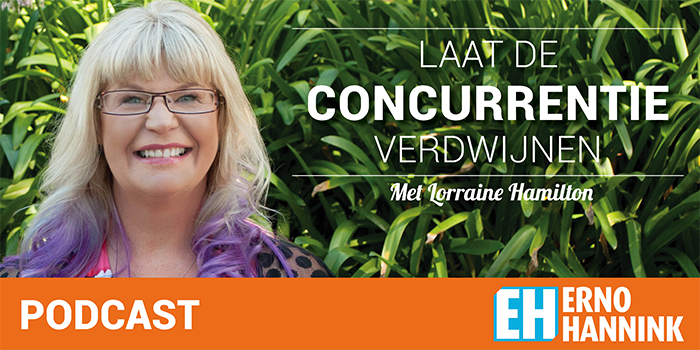 Vandaag het gesprek met Lorraine Hamilton, een award-winning entrepreneur en coach. Ze gebruikt sterke mindset werk gekoppeld een bijzondere communicatie inzichten, om haar klanten op te laten vallen in de massa en op een authentiek manier. Zo lijkt het alsof de concurrentie als sneeuw voor de zon is verdwenen. I help my client stand out so uniquely that the competition will melt away. There is always an obstacle blocking your growth, blocking you path. We start by taking that obstacle away, the fear. Then we start looking for the true value that the client can offer. I spent a lot of time with my clients determining where they want to position themselves in their market, what their goals are and who they want to work with. In order to do this, we have to disconnect self-worth with pricing. After that we find a way to really put you value in the spotlight. When people enter the market, I usually have them set a higher price than they had in mind for themselves. This is because they don’t have a large reach yet and it is wiser to set your price al little higher. After a while when you reach increases, you can start to compensate this with a price that is a bit lower. I can do really new and exciting things while staying calm. My nature is being calm. I always follow my intuition in difficult situations, for instance when there is fear involved in making a decision. There will always be an underlying sense of calm and my gut will tell me that this is the right path. I see a lot more result for my actions when listening to my gut. This is really satisfying and this is what is try to implement with my clients. Take all of that money that you are using on trainings and hire somebody that can really help you implement knowledge rather than learn you more, if you are having trouble with that. Taking this action will give you the feedback and help you find out the next step for your business.